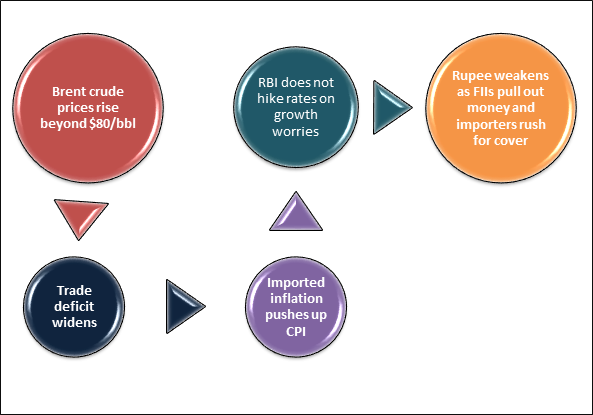 How to benefit from the oil price rise and the rupee fall? There are ways investors can actually benefit from this interplay of oil, inflation and rupee. Let us look at five such options. Oil prices are rising (both petrol and diesel) and we are seeing that in our fuel bills. For the first time in history, the petrol and diesel prices have gone up consecutively for 12 days in succession. But a rise in the price of crude is not just about higher petrol prices and higher fuel costs in the household budget. It is a lot more. As the graphic below shows, a rise in crude oil prices widens the trade deficit, pushes up inflation, puts the RBI in a dilemma on rates and also weakens the rupee. Interestingly, we have seen all these happen in the last few months. Inflation has gone up consistently in the last four months and the trade deficit has widened to around $15 billion per month. The current account deficit (CAD) has crossed 2% of GDP and the Indian Rupee is close to its all-time low of Rs.68.80/$. In this period of uncertainty, what should an investor do? Interestingly, there are ways investors can actually benefit from this interplay of oil, inflation and rupee. Let us look at five such options. That sounds quite simple. Oil extractors are the obvious beneficiaries. The crude extracted by oil companies is a commodity and is directly linked to the landed cost of crude. These companies will see an expansion of top-line and bottom-line when crude prices are up. What about refiners? Most refiners will benefit in a very different way. For example, refiners hold huge inventories of crude for their regular production. When the price of crude rises, the valuation of inventories automatically goes up and props up their profits. Of course, there is a worry that the government could impose a cess. But the cess will have a cut-off of $70/bbl and upstream oil stocks are quoting at valuations equivalent of $60/bbl crude price. That could be a good way of benefiting from the oil risk. Interestingly, there is an inverse relationship between oil prices and the interest in alternate energy stocks. Specific plays like wind energy stocks, solar energy stocks, panel equipment makers etc are unlikely to excite investors when oil prices are low. But, when crude crosses $80/bbl, the investment and the interest in alternate energy stocks is back. There may not be too many plays on the alternate energy stocks but if you scour through the list, there are ample indirect plays on the alternate energy sector. They could be your choice. When the rupee weakens, Indian exports become cheaper and therefore more attractive to global importers. The Indian IT industry and the Indian pharma industry were largely built on the strength of a weak rupee. A weak rupee as an outcome of higher oil prices will offer a boost for exporters. The INR is already overvalued in Real Effective Exchange Rate (REER) terms and this weakness of the INR will correct the trade balance automatically. Above all, export oriented stocks in IT, Pharma and auto ancillaries could actually get a boost. Companies that deleverage (reduce their debt) are attractive at any point of time. That is because they are reducing their financial risk. But in times like these, they become additionally attractive. Here is why! When crude prices go up, the RBI will be constrained to hike interest rates. That will increase the borrowing cost of high leverage companies and add to their financial risk. Companies that are reducing debt will be automatically more attractive. In case of companies that are reducing their foreign currency debt, it will be a double benefit. These companies will gain opportunity benefits from a rise in interest rates and weakening of the rupee. Investors may wonder how gold could be relevant at a time of rising crude prices and falling rupee. Rising crude and falling currencies are not restricted to India alone but it is a global phenomenon. Most of the oil consuming EMs are facing this problem of weakening currencies. Normally, in the midst of any economic crisis or geopolitical tensions, gold is the natural asset of choice. It is less volatile and holds value even in the worst of times. Of course, like prudent asset allocators, your exposure to gold should still be in the 10-15% range but you can surely move your allocations closer to the upper end of the range. The moral of the story is that even in the current situation of rising oil and falling rupee, there are still investment opportunities aplenty.